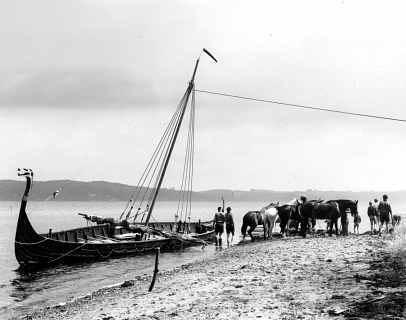 For more than four decades, the Imme Gram was the largest Danish Viking ship, but it was finally surpassed only when the Viking Ship Museum in Roskilde launched The Sea Stallion in 2004. Imme Gram was built by the scouts of the town of Gram as a replica of the only known Danish ship burial, the Ladby Ship on Funen. The grave contains little more than a print in the clay, and therefor part of the replica is based on educated guesses, revised as time passed. 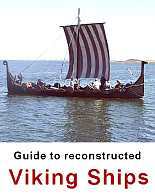 It was not, though, built in axe-cleaved planks or using replica tools. The ship’s name is derived from it being built by scouts from the town of Gram, while the actual building took place in the forest of Emdrup, earlier known as Imme. The name won such renown that other shipbuilding groups of scouts started naming their ships Imme-, such as the Imme Struer and the Imme Skinfaxe. The ship requires a large crew; at least 20 oarsmen are needed when there is no wind. In spite of declining numbers in recent years, it is still a ship that can boast a large guild. Minimum crew: 6 persons. Sailing normally only takes place with a minimum of 20 persons, to ensure the nessesary power for rowing. Boat Guild: Tønder Ships Guild has aprox 200 members and is open to other interested. Terms of hiring: Not possible. Sailing only with the guild members.